COMING FACE TO FACE WITH THE 'NOTORIOUS' CONOR McGREGOR. The only way to get our great warrior on the canvas! Incredibly proud to have two of my paintings in the rightful hands of the ever inspiring Katie Taylor! I'm thrilled you love them champ. Keep going from strength to strength! As a lifelong Irish football fanatic, it was with the greatest of honour that I presented this iconic portrait of our leader... The truly inspirational Seamus Coleman! I'm truly touched that my work is taking pride of place in the Coleman family home. Extra special on the same weekend Seamie was given freedom of his beloved Donegal! The Italians know fine art when they see it! I'm very proud to reveal that former Italian international striker Pierluigi Casiraghi is the happy owner of one of my portrait paintings. Gigi has had a wonderful career, which includes winning 2 UEFA cups & a Coppa Italia with Juventus, another Coppa Italia with Lazio, as well as an F.A Cup & UEFA Super Cup with Chelsea.... Not to mention a runners up medal at FIFA World Cup USA '94! I'm thrilled you love your portrait my friend. FUN FACT: When a certain young Brazilian football legend by the name of 'Ronaldo' went up to collect his World Cup winners medal and hold aloft the famous trophy, he did so wearing Gigi's jersey, having swapped after the final. 'TAKING ON THE TERMINATOR' - HOLLYWOOD ICON ARNOLD SCHWARZENGGER, AT A PRIVATE SIGNING OF ONE OF EUGENE'S PAINTINGS. An incredible honour to have my painting personally hand signed by the man who inspired it. The greatest goalkeeper to ever grace the Irish net... Shay Given. The legendary All Blacks superstar Jonah Lomu took the world by storm at the 1995 Rugby World Cup. His imposing stature struck fear into every team he faced. My memories of Jonah is this iconic figure running effortlessly in a straight line, arm with ball outstretched and series of opponents seemingly bounce off of him! With the contact of Jonah's brother John, my painting of the late great now hangs proudly beside his All Blacks jersey in the family home of Jonah's dear mum Hepi. What a beautiful trip down memory lane to create this portrait for the family of wrestling great 'The British Bulldog' Davey Boy Smith. So many wonderful childhood memories because of this guy. I still cannot believe he is gone but he will never be forgotten. Special thanks to Diana Hart Smith, Harry & Georgia. Presenting one of my earlier paintings to the legendary Paul McGrath. This painting was signed by Paul and sent to auction where it raised fantastic funds for Children with Autism. FUN FACT: This piece actually started an incredible snowball effect of Irish football player portraits. Pro 12 champion with my local rugby side Connacht, Bundee Aki is loved all throughout my native Galway as a fierce competitor on the rugby field but a fun loving gentleman off it! I'm certain I speak for everyone when I say how thrilled I was when he opted to play for Ireland and in his first major tournament 'Uce' won The Six Nations Championship, Grand Slam & Triple Crown titles! Irish boxing sensation 'Sugar' Ray Moylette has enjoyed huge success as an amatuer and since turning professional, the Mayo native has a flawless 100% record. Knowing Ray for over a decade and following career with keen interest, I know how far his talent, work rate and personality will take him... He's the complete package, watch this space! 8th October 2015 will go down in Irish football history as one of our greatest ever results. In a crucial must win game at the Aviva Stadium, Dublin, Shane Long struck a stunning winner to over turn one of the heavyweight giants of the game- World Champions, Germany. I'm thrilled Shane loved my portrait from that epic night! There are few players who display the sheer pride and raw passion that James McClean does each and every time he pulls on an Ireland shirt. I have huge respect for him. Republic of Ireland midfielder David Meyler with two paintings to mark the great honour of leading out his country as captain in the World Cup qualifiers against Moldova and the huge win away to Wales in 2017. 1-0 down, deep into stoppage time. Away to the world champions Germany,in a crucial Euro 2016 qualifier... and on his 100th cap for his country. It really doesn't get much more epic that that! It was a real pleasure to recreate this iconic moment for one of Ireland's most decorated footballers- the legendary John O'Shea. Two safe hands warrant two portrait paintings! As a kid, I used to dream of becoming Ireland's next goalkeeper... but then they stumbled across this man.... 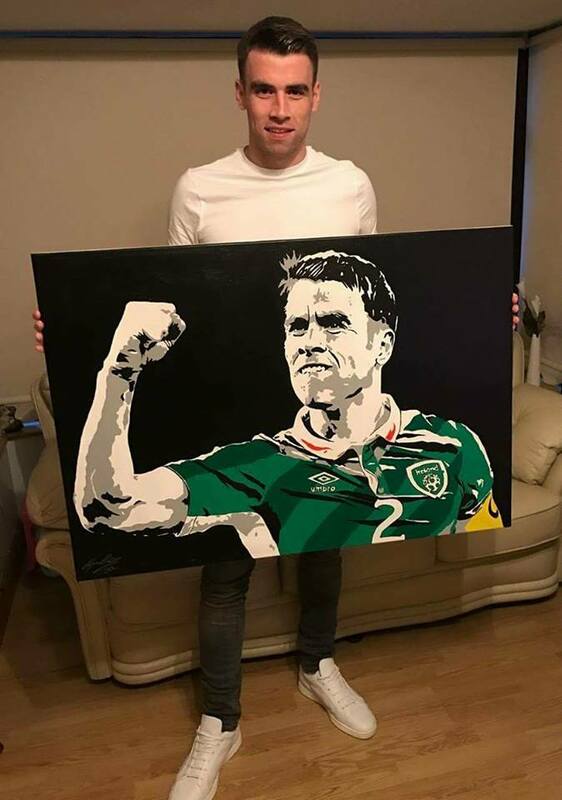 I'm big enough to admit they made the right choice😉 It is with the greatest of pride to know two of my paintings now reside in the home the greatest goalkeeper to ever grace the Irish net, the one & only Shay Given!🍀 Thank you for the great honour & glorious memories my friend! COMING SOON... A WORLD CUP 2018 SUPERSTAR & A BALLON D'OR WINNER!